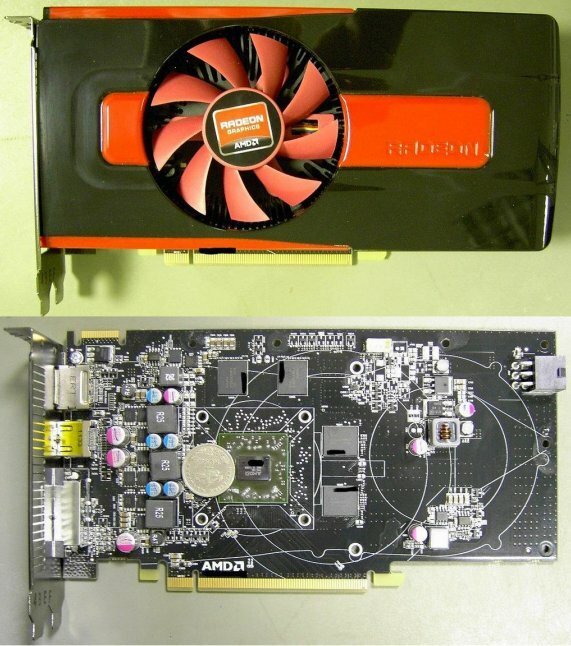 TPU came across two photos of AMD's upcoming Radeon HD 7770 "Cape Verde" graphics card. It has a TDP of around 100W, a single 6-pin PCIe power connector, four GDDR5 memory chips (128-bit bus? ), single CrossFire connector and DVI/HDMI/DisplayPort outputs. First pictures of AMD's mainstream card, HD 7770, have now been leaked online. This card is the first major upgrade to the HD 5770 in two years, since the HD 6770 was just a rebrand. It features the Cape Verde GPU, which replaces the Juniper GPU used in the HD 5770/HD 6770. The card looks somewhat different, with a large fan sitting on top of the GPU, blowing directly onto it and the card's length is the same as the HD 5770, at around 8.25 inches.